I taught a class a while ago where we created distress oxide backgrounds similar to this one. I began with a piece of hot pressed watercolour paper, swiped my salty ocean and fossilized amber distress oxide inks across the panel then spritzed it generously while holding the paper upright which enabled the ink to run down towards the bottom of the panel. I held it the opposite way so the lighter colour ran back into the darker. I kept doing this until I had a fully covered, blended background. It’s hard to see in the photo but I spritzed with pearl-ex spray which created a sparkly sheen over everything. (I create my own pearl-ex spray by adding less than ¼tsp pearl-ex powder to a small spritzer full of water) Once the panel was dry I splattered some more spray over the background and dabbed it off with a paper towel to created the patchy light and dark effect. 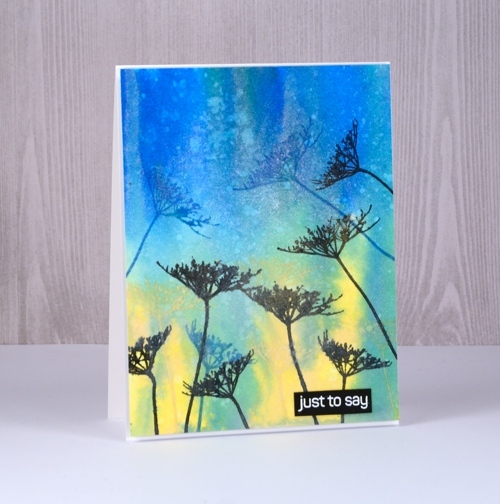 I stamped the Queen Anne’s lace stamps from the Penny Black Flower Sparks set in fossilized amber, salty ocean and black soot distress oxide inks. To finish I attached to a white card base and added a white on black embossed sentiment. All the supplies are listed below; some include affiliate links which give me a small commission but add nothing to your costs. Anytime you feel like browsing in The Foiled Fox online store, clicking through from the Foiled Fox promo in my side bar will send some commission my way if you make a purchase. And while we are chatting about the lovely folk at The Foiled Fox I have an inside scoop: they are starting a loyalty program where you will earn ‘foxy dollars’ every time you make a purchase there. Even though it hasn’t officially begun any November purchases will count towards your future foxy dollars! Today I have a couple more emboss resist projects to remind you we would love to see your projects on the Simply Irresistible Challenge. The Foiled Fox and I have teamed up (as we like to do these days) to issue you with a card challenge. You just need to make a card featuring the emboss resist technique, load it up on your own blog or social media platform then link it on our challenge page. 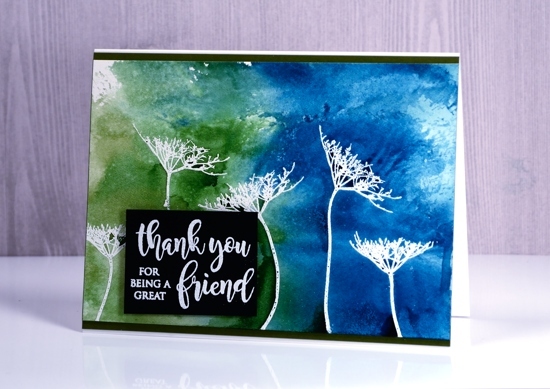 I embossed the Queen Anne’s Lace stamps on hot pressed watercolour paper for today’s cards then painted over the panels with gansai tambi watercolour paints. As you can see in the close ups, the paint resists the embossing and pools darker in some of the enclosed spaces or against the embossed stems. It is such a cool technique. I played with two colour schemes, my tried and true blue/pink combo and a deeper blue/green one. 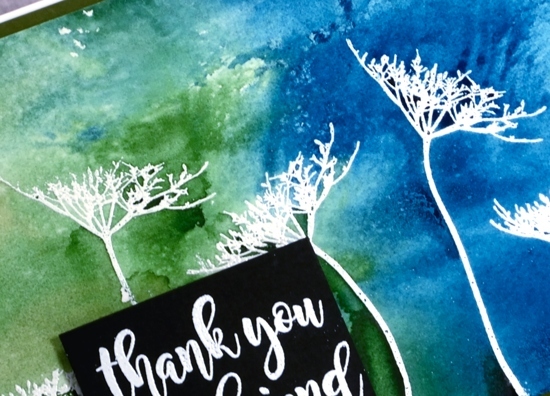 The gansai tambi paints can be a bit opaque if not diluted enough so I used sufficient water for them to run over the embossing and resist it, not cover it. 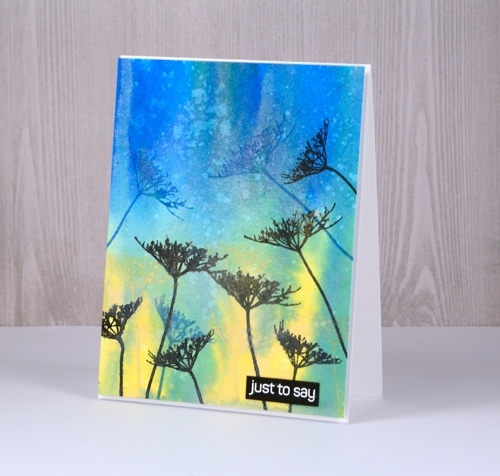 Today’s card features more watery blurred stamping, probably not the look we usually aim for when creating cards. 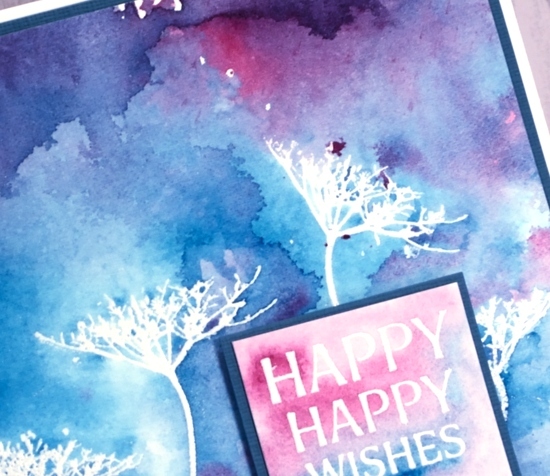 I was having fun experimenting with some of the stamps I hadn’t used from the new “Bring on the Happy” release. 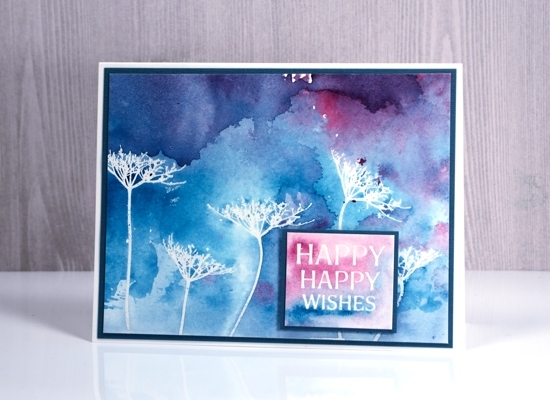 These flowers are from the ‘Flower Sparks’ set which I had dipped into to make this card but had not used the other eight flower stamps. I used markers to ink the stamps and stamped on watercolour paper. To make the colour flow around the panel I spritzed and tilted the paper. 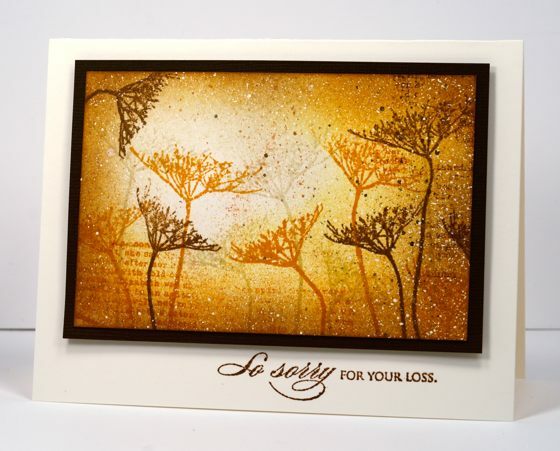 Once again I used black for my sentiment and also borders and two die cut flowers. 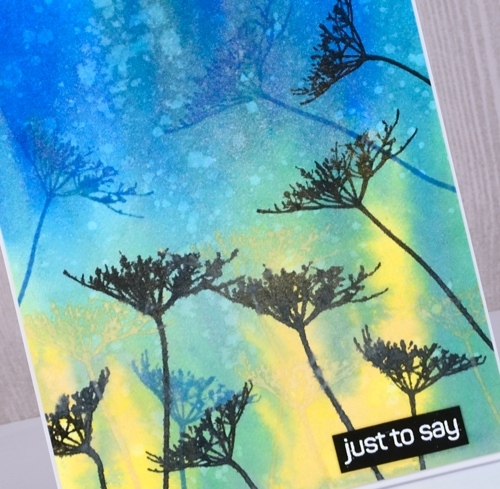 There is a new challenge on the One Layer Simplicity blog hosted this month by Susan. She is challenging us to use only our word stamps, no flowers, trees, background stamps are allowed, only words! I hope you get inspired. Perhaps the extremely cold weather we’re having at present is making me reach for warmer colours. The last three cards I’ve posted have featured warm golden tones. 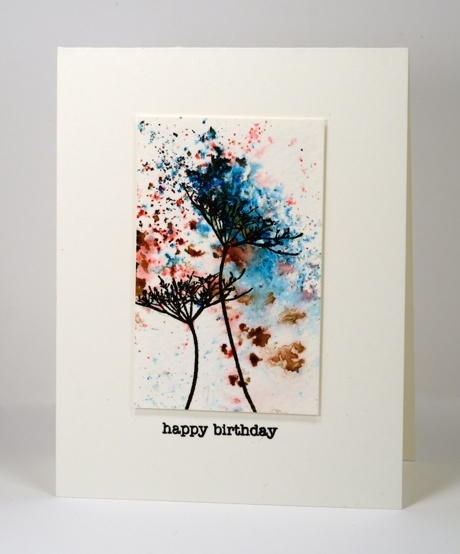 This card was stamped with two stamps from the new transparent set ‘flower sparks’. It is the first time I have used the set and I discovered it’s a clever little set. There are ten flowers in the set and each one is on a long thin stem which you can bend this way or that before you stick it on your acrylic block. With that kind of flexibility you end up with way more than ten stamps! Cool huh? I used the same two stamps over and over but bent the stems different ways each time. I began with a piece of white cardstock flecked with masking fluid. Over that I stamped several flowers in antique linen distress ink. I chose a position for my light source and sponged antique linen, wild honey and vintage photo distress inks over the panel. 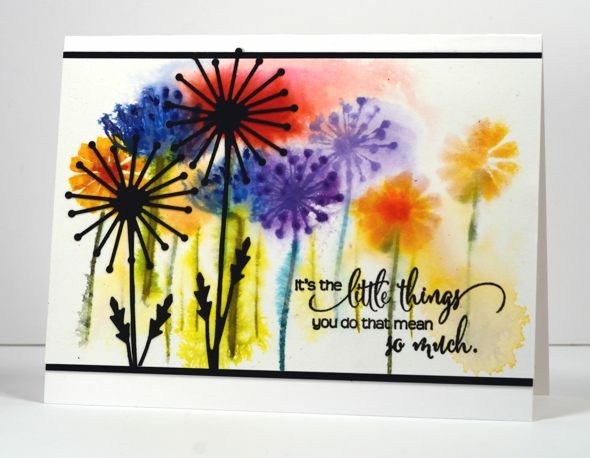 When the sponging was done I added more flowers with the two darker inks. I grabbed a couple of watercolour pencils to flick spots of brown and honey colour in a few places before removing the masking fluid. It is matted in a textured brown cardstock then popped up on a natural card base.